Mushrooms absolutely have to be up there near the top of my list of favourite foods. I love a mushroom risotto and mushrooms with pasta especially, but a nice big stuffed portobello mushroom makes a really nice side dish for a great variety of meals. Blue cheese goes perfectly with mushrooms and I’ve used a stilton here but any blue cheese will do. They make a really nice side if you’re having steak. Again steak and mushrooms are perfect partners. 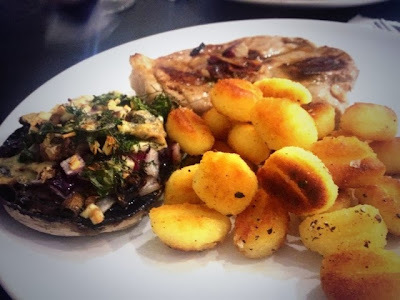 My sister and I made these together and served them with lamb steaks and Nigella’s rapid roastini. This dish requires absolutely minimal effort but delivers maximum flavour so it also makes a great starter served with a little rocket salad. For the party season use smaller mushrooms, leave out the extra mushrooms for the filling and these bite sized versions would make a great canapé. 1. 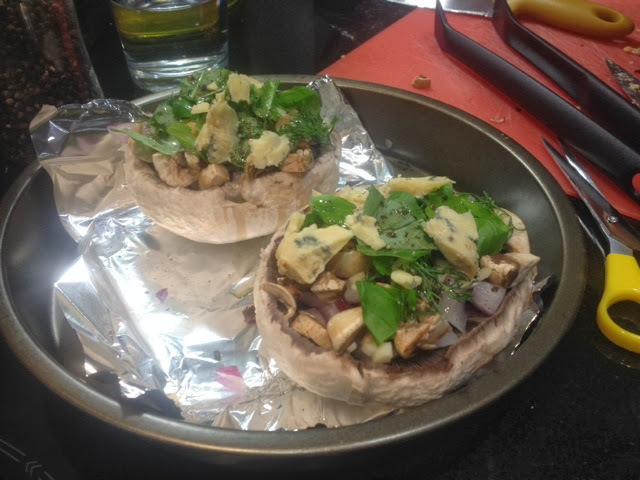 Fill the two large mushrooms with the diced chestnut mushrooms, red onion and garlic. Season with salt and pepper before sprinkling over the herbs and crumbling on the blue cheese. 2. Bake in the oven for 20 minutes. 3. Dish up alongside your meal or with a small salad as a great tasty starter.